During 2001 Shao Ping and I lived in Choa Chu Kang in Singapore. It is a ‘new town’ located in the north-west of the island. We lived in an 11 storey Housing Development Board building on Choa Chu Kang Avenue 4. As you can see from the Google Maps image below the town is a maze, albeit highly organised at that, of high rise buildings. We quite enjoyed our time in Choa Chu Kang. The bus service was excellent. The MRT was nearby and there were plenty of handy shops. In the midst of this highly urbanised environment were two nearby Buddhist temples. Within a couple of minutes of our flat is the Hai Inn Temple. About 15 minutes in the other direction is the Uttamayanmuni Buddhist Temple. From time to to time we would visit either temple. The temples provided a moment of tranquility. The Hai Inn Temple, Singapore. Gallery. 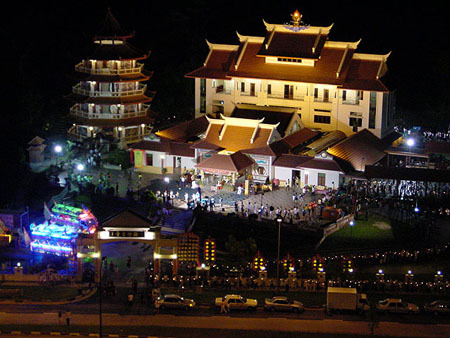 The Hai Inn Temple is positioned to the south of Choa Chu Kang in Bricklands Road. Here are the directions to the temple. It is quite a beautiful temple, like all Buddhist temples come to think of it. The temple has its own web site which you can explore here. The Uttamayanmuni Buddhist Temple, Singapore. Gallery. 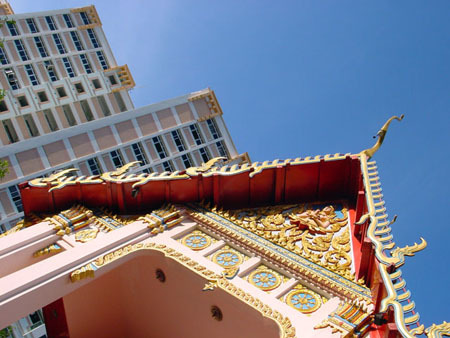 The Uttamayanmuni Buddhist Temple is an interesting temple that follows the Theravada tradition. It has a statue of the four faced Buddha. The decorations on the temple are quite exquisite. The temple is almost completely surrounded by the HDB Blocks of Choa Chu Kang. There is a private condominium located on one side. I sometimes take the MRT to Choa Chu Kang and go for a walk around the town to capture some of that time duirng my visits to Singapore.